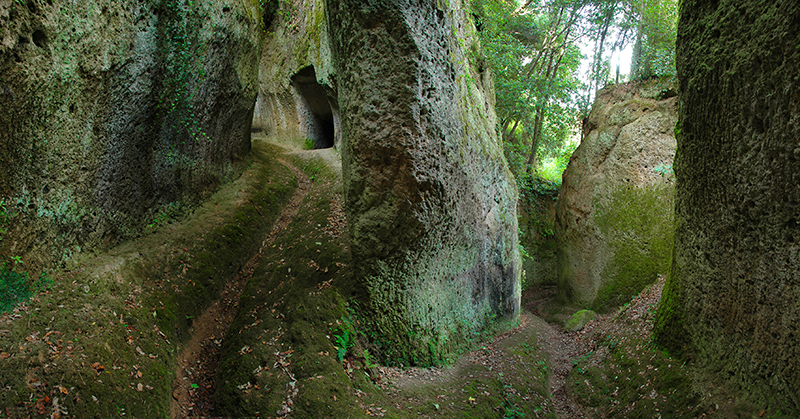 The Etruscan Sacred Ways are only found around three southern Tuscan towns: Pitigliano, Sovana and Sorano. 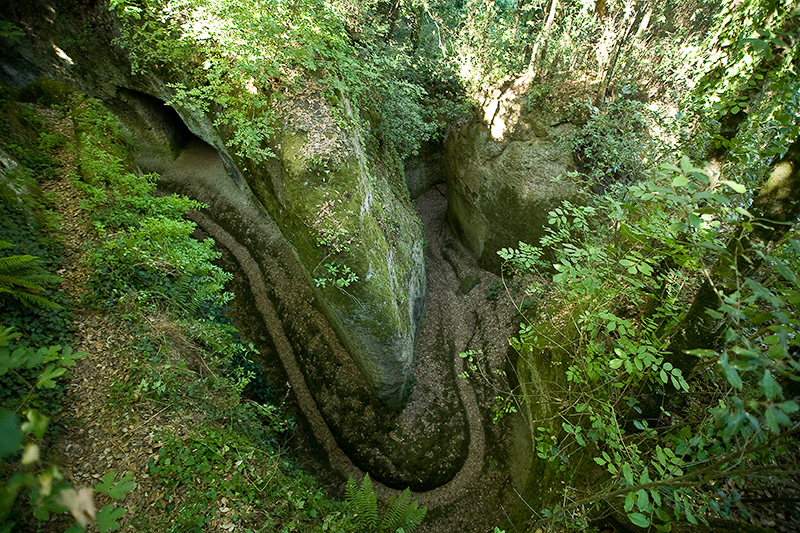 Some are very deep, up to an astonishing 20m, hewn out of solid rock by the Etruscans about 2500 years ago, and some paths are very long indeed; all of them are winding and twisting like the above. Why were they excavated? Why only in this area? Nobody knows. They are not strictly roads as they don’t lead anywhere, most of them meandering around apparently aimlessly. Were they used for mysterious chthonic rites? Quite possibly. What we see now is a shadow of their former selves. All of the ways have collapsed at least in part as tree roots have undermined the steep sides, so that they are much wider and shallower now. Also they would once have curved in at the top, the two walls almost meeting and thus letting in very little light to the path below. It must have been a very eerie during the day, even more so at night. The Etruscans are a very mysterious people. They spoke a non Indo-European language, their language has only been partly deciphered and anyway their literature is almost completely lost. But the Sacred Ways are dying…. of neglect. Tree roots are the worst enemy.They split the walls and a huge wedge of cliff falls down into the ravine. Until about 50 years ago the farmers used these ways to reach their fields, they maintained them and cut down the trees. Now the land is abandoned and the municipality does nothing to maintain these treasures that have survived 2,500 years only to die of neglect in our lifetime.